Our PVS-RS2-2 PVC vent screen set is well suited for high efficiency appliances, such as furnaces and power vent hot water heaters, that utilize both an intake and exhaust vent. Included in this set are two vent screens and two stainless steel internal retaining wires. 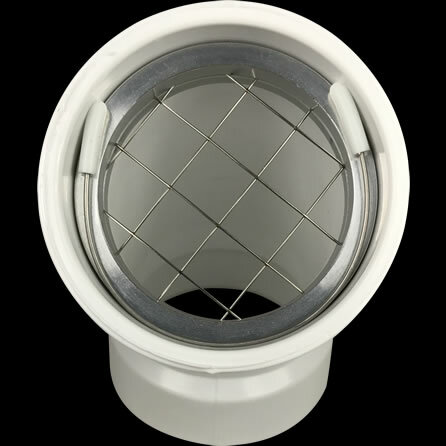 Fitment: Both vent screens included in the PVS-RS2-2 set are designed to install securely inside any 2″ PVC vent termination hub or coupling with an inside diameter of 2-3/8″. Our PVS-RS2-2 PVC vent screen set includes two 2″ screens and two internal wire retaining clips. Ideally suited for high efficiency furnaces, power vent hot water heaters and boilers that utilize separate intake exhaust vents, this kit guards your appliances and home from curious outdoor animals. It’s unfortunate, but many small outdoor animals die each year as the result of entering an unprotected PVC exhaust vent. Whether it be a squirrel, chipmunk, mole, mouse or bird, properly protected PVC venting systems can be secured in an environmentally friendly way. In addition to saving the lives of outdoor animals, our PVS-RS2-2 can also shield you from very expensive HVAC, plumbing and pest control specialist bills. With our PVS-RS2-2 two inch PVC vent screen kit, in as little as sixty seconds, your high efficiency appliance and home can be fully protected from outdoor animals and debris. Our unique internal wire retainers also means that you will probably never notice these vent screens after they are installed. We also sell PVC insect vent screen kits as well, which may be useful to protect your furnace’s intake and exhaust vents from insects (bees, wasps, etc.) during the summer while the appliance is not in use. Not sure what size vent terminations you have? No problem, we’re here to help! Please visit this page to learn which measurements are needed to determine the vent screen size you need for your high efficiency boiler, furnace or hot water heater.